Veritas of the Water is a 6-star unit that plays the Magic Damage and Healing roles. Like most of the other Veritas, this units stats are great and well rounded. The big note about Veritas of the water is that this unit only has 3 skills. Mind Blast, Mist, and Forbidden Arts. However, with Forbidden Arts, it allows access to 3 other skills. Most of VotW damage is going to come from their magic which is set up nicely. Drain and Osmoses are good for recovery purposes, Esuna and two cure spells for healing, Raise for obvious purposes, and some water spells for damage. VotW is also set up well in Traits having the right kind of Stat boosts, water absorption, and an auto refresh. 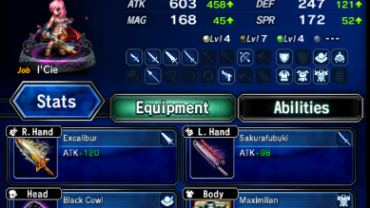 Her equipment is kind of abysmal and not something this unit is really focusing on. Veritas of the Waters is neutral to all elements and status ailments. Veritas of the Waters can equip 2 weapons and 4 armors. One of the Sworn Six of Paladia who invaded Olderion. She used cruel and foul means to take the lives of many of Olderions citizens, including those of the family of Nichol, her longtime enemy. On the other hand, she has another gentle spoken side to her, though the source of this dangerous two-sided personality is unknown.